Four gaited competition horse, son of the four gaited stallion Borði frá Fellskoti (8.24) and Stelpa frá Kanastöðum. Kórall frá Kanastöðum is a big and handsome 8 year old black gelding with a star. He has very high movements naturally and a great temperament. Kórall is an extremely promising 4 gaiter with good and even gaits. While his tolt needs some work, it shows great promise. Kórall definitely has potential to become a competition horse at the highest level in 4 gait and tölt competitions. He could possibly develop into a 5 gaiter. Kórall is cooperative and fun to work with. He would be great for a good rider to keep working with and take to the highest level. He is son of the four gaited stallion Borði frá Fellskoti (8.24) and Stelpa frá Kanastöðum. Borði frá Fellskoti (8.24) is a great four gaited stallion he has 7.89 for Conformation and 8.48 for Riding Abilities; 9.5 for tölt, 9 for trot, 9 for gallop, 9 for spirit, 9 for general impression and 7 for walk. Total 8.24. He has also 8.5 for slow tölt and 8.5 for canter. Borði frá Fellskoti is son of Hugi frá Hafsteinsstöðum (8.31) and Sokkadís frá Bergstöðum (7.87). Hugi frá Hafsteinsstöðum (8.31) is a four gaited stallion, he is son of Hrafn frá Holtsmúla (8.56) and Sýn frá Hafsteinsstöðum (8.07). Hugi has 8.16 for Conformation and 8.23 for Riding Abilities; 9 for tölt, 9 for trot, 9 for gallop, 8.5 for spirit, 9 for general impression and 6.5 for walk. Total 8.20. Hrymur has also 8.5 for slow tölt and 7.5 for canter. 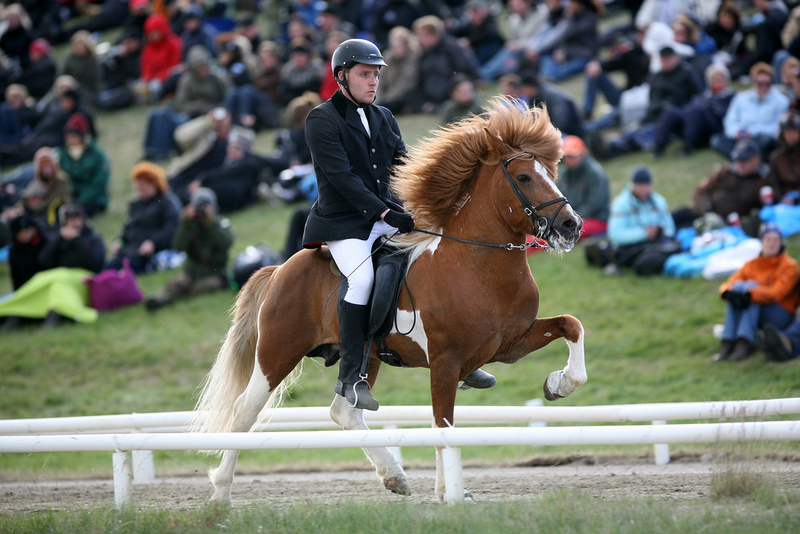 Sokkadís frá Bergstöðum (7.87) is a second price mare, daughter of Þorri frá Þúfu (8.26) and Lokkadís frá Bergstöðum. Sokkadís has 7.88 for Conformation and 7.87 for Riding Abilities; 8 for tölt, 7 for trot, 7.5 for pace, 7 for gallop, 8.5 for temperament, 8 for character and 8.5 for general impression. Total 7.87. Stelpa frá Kanastöðum is daughter of Ásaþór frá Feti (8.31) and Mjóblesja frá Kanastöðum. Ásaþór frá Feti (8.31) is son of Kraflar frá Miðsitju (8.28) and Ásdís frá Neðra-Ási. 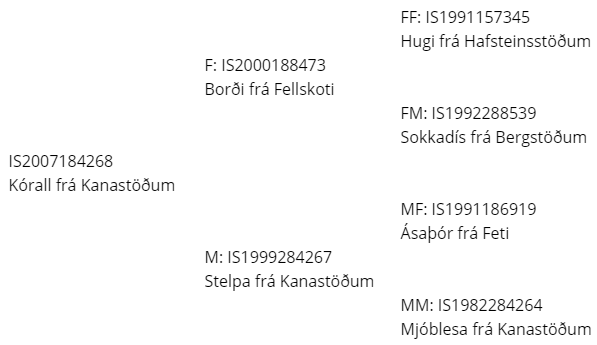 Ásaþór has 8.25 for Conformation and 8.37 for Riding Abilities; 8.5 for tölt, 8.5 for trot, 7.5 for pace, 8 for gallop, 8.5 for temperament, 8.5 for character and 9 for general impression. Total 8.31.